We supply all paint brands as well as hundreds of wallpaper designs and fabrics from most major manufacturers. Our customers – both tradespeople and homeowners – come from all over the Loughborough area, for our wide product range and the expert assistance they know they’ll receive. Our team is extremely experienced, with a long history in the decorating business, and our branch manager is a painter and decorator by trade. Professionals love that we really understand what they need, and DIYers love tapping us for our hands-on knowledge. 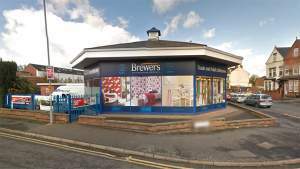 The Brewers Decorator Centre in Loughborough is just a ten-minute walk from the town centre, and the railway station in the other direction. We’re in the octagonal building on the corner of Duke Street and Clarence Street, opposite SG Cars – you can’t miss our building and our large window displays. Parking, including disabled bays, is outside on Duke Street. Follow Toothill Road until reaching traffic lights and go straight over onto Clearance Street and the store is on the right just before the turning onto Duke Street. Follow Meadow Lane going Southbound until reaching the traffic lights and then turning left onto Clearance Street and the store is located on the right just before the turning Duke Street. Follow Meadow Lane going Northbound until reaching traffic lights and then turning right onto Clearance Street and the store is located on the right just before the turning Duke Street. Follow Nottingham Road going Northbound until reaching a turning onto Clearance Street and follow that road until passing Duke Street on the left and the store is located just after on the same side. Follow Nottingham Road going Southbound until reaching a turning onto Clearance Street follow that road until passing Duke Street on the left and the store is located just after on the same side. Follow Clearance Street until passing Duke Street on the left and the store is located shortly after on the same side.